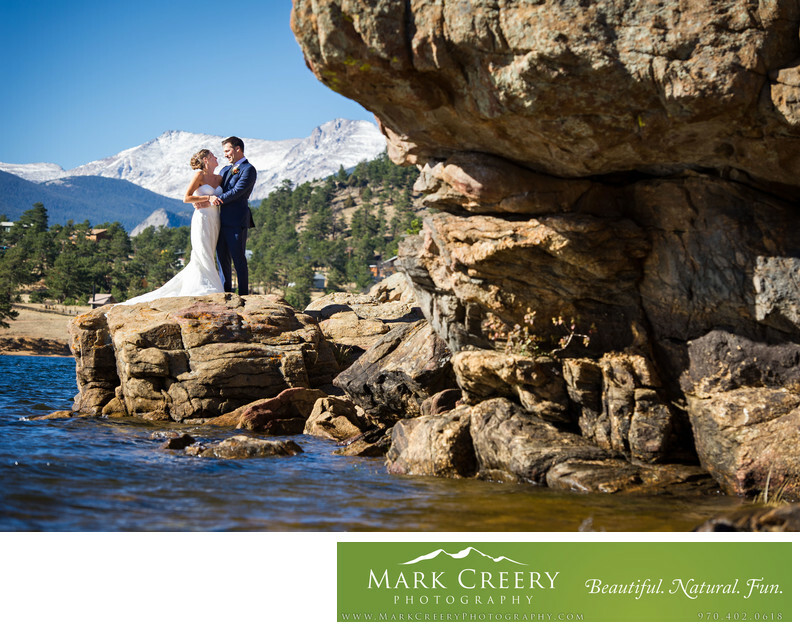 This gorgeous bridal portrait at Marys Lake shows off some of the varied scenery in Estes Park and just near the Lodge. I love the unique rock features just close to the lodge, and this one down by the lake has interesting curves. I chose to zoom in with my telephoto lens to compress the background behind the couple. I framed the couple's heads inside the lines of the mountains, which draws the viewer's eyes to the snow-capped peaks behind them. I particularly enjoy the blue sky and blue water, and I had to expose the image just right to not over-expose the sky while still having the right tones with the bride and groom's faces. This is tough in the bright sun of Colorado, but the quality of my camera allows me to adjust this with my software after the fact. If you'd like to see a panoramic version of this photo check out my panoramas gallery. This was an October wedding, and it had just snowed recently which added an extra element to the photo. It was a windy day, which made the ceremony later very cold as they sun dipped behind the trees by the venue. Mary's Lake Lodge started in 1913 and has since been added on to and expanded to include beautiful condominiums that allow guests to stay on-site during the whole event. Their ceremony location, called the Forever Garden, is just uphill from the lodge, so you have sweeping views of Estes Park Valley and are framed by some aspen and evergreen trees. Marys Lake Lodge Mountain Resort & Condos is located in Estes Park, Colorado. Contact: (970) 586-5958, info@maryslakelodge.com. Location: 2625 Marys Lake Rd, Estes Park, CO 80517.